Hacienda Irurena belonged to three Peugeot brothers of French origin who traveled frequently between PR and France. It was originally a coffee plantation established by Pedro Peugeot and turned into a sugar plantation in 1860 when Juan Peugeot installed an oxen-driven mill with wooden crushers or "trapiche". The Peugeot's were from the Basque Country in Southern France; supposedly Irurena means "three brothers" in the Basque language. In their absence, the plantation was managed by their friend Juan Labadie Larré (1836-1894) also a Frenchman from Urrugne in the Pyrénées Atlantique. After Juan Peugeot's death, in 1875 the hacienda was acquired by Labadie who operated and lived in it until his death in 1894. Before Labadie married Cornelia Pellot (1851-1931) on September 23, 1893, he had fathered four children with her, Cornelia was the natural daughter of freed slave Dolores Pellot. In 1905, Cornelia demolished the old wooden structure that served as the hacienda's manor house and built the new house that had been designed in 1893 by Frenchman Paul Servajean, then the administrator at Central Coloso in nearby Aguada. The steam engine and boiler from the closed down Hacienda Tiopolis in Rincón was installed at Irurena in 1902. Irurena stopped operating in 1909 when sugarcane grown in the plantation was then processed at the nearby Central Coloso . 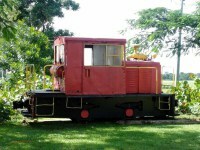 The house and locomotive pictured are the only remains of this Ingenio which is now owned and maintained by the Municipal Government of Moca. This property was included in the National Register of Historic Places in 1987, pictures of the vacant property taken in 1985 before it was restored by the Municipal Government accompany the submition. Originally the house was known as Castillo Labadie. The setting for the novel La Llamarada written by local writer Enrique A. Laguerre was inspired by this property which in the novel was called the Hacienda Palmares, owned by the Moreau family. Hence the house is commonly known today as the "Palacete Los Moreau".